There are no fees to this adventure. No opening hours, just another great thing that you can do while visiting Ubud. This is just one of these places that are better to be experienced on foot than through renting a vehicle as it consists of a maze of tiny streets, waiting to be found. At the end of which almost always lies a beautiful rice paddy or terrace. Whether you like a more intense hike, or are not very keen on outdoor adventures. Ubud has walkways to suit all levels of expertise. Rice fields are decorated with shrines to honor the rice goddess. Plastic objects lined over the rice field to scare the birds or such as this one, simple for fun. With beautiful sceneries, friendly people its very easy to feel comfortable, relax and unwind. Think, read books, get inspired, rejuvenate in one of many spas and surround yourself in a different almost out of the ordinary world. Ubud Relaxing Atmosphere often pleases more a traveller seeking peace and quiet rather than those looking for an intense nightlife experience. Ubud amazing culture is said to be the center of arts and cultural activities in Bali. Imagine sitting in a comfortable cafe while enjoying your brunch and find yourself surrounded by a procession of women and man dressed up in traditional Balinese costumes singing and playing traditional gamelan. Almost every week of the Balinese calendar is dedicated to a celebration with music, dances, festivals. Auspicious days so different that barely compare to even the most unique western community gatherings. 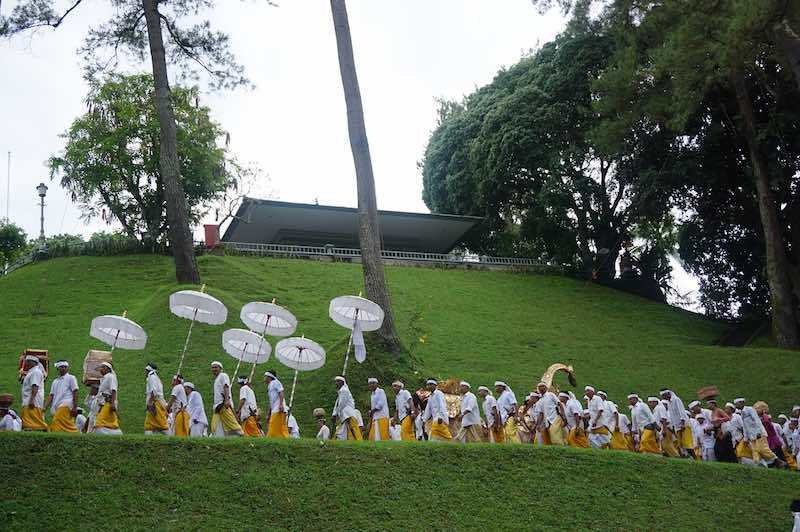 Ceremonies are one of the most important and beautiful aspects of Balinese life. It is a complete sensory experience; with colorful costumes, traditional music, incense smoke, and special ceremonial food. Ubud Amazing Culture it is quintessentially what makes Bali famous. Ubud amazing culture seems to have a temple on every street corner, and with ceremonies almost everyday it is a very accessible experience. Depending on the date of your arrival you may find that there is a full moon celebration, day of silence, day for money, or even day for electrical appliances. Ubud Magic in the air, it's difficult not to feel it. Almost everyone who spends more time admits that there is something magical in this small town. Perhaps its the spirituality of the Balinese people who spend their days celebrating or practicing cultural rituals that gives this impression or maybe its the air. Maybe its nature, perhaps it's a mixture of all of them. Sacred Temple Monkey Forest, Ubud Sanctuary is a nature reserve. A place to see a Hindu Temple and a home to approximately 340 macaque monkeys. Considered by the Balinese as sacred. Monkey Forest is a symbol of harmonious coexistence of humans with nature. It's an area comprising approximately a tenth of a square kilometer and housing over 115 different species of trees. The government of the local village of Padang Tegal created a foundation "Padangtegal Wenara Wana Foundation". Which educates individuals on the species of trees, maintains the sacred integrity of the forest and promotes the site as a tourist destination. For more information stop by their office located right outside of the main entrance to Monkey Forrest. 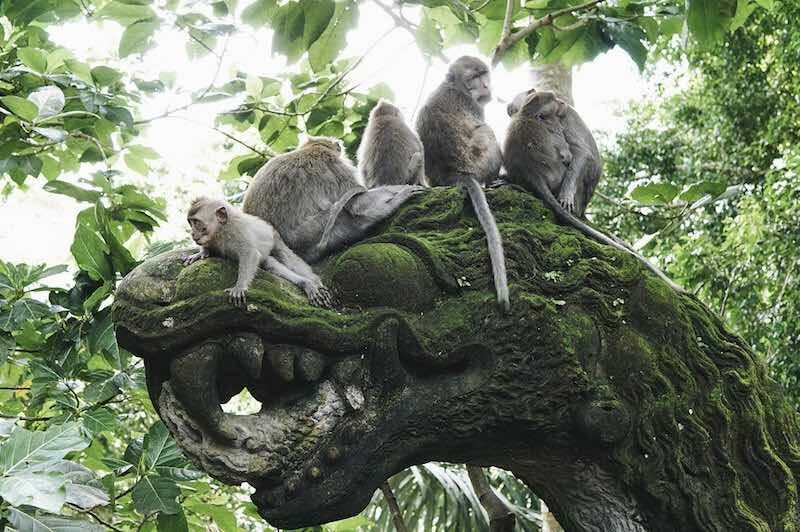 For the Balinese the most significant part of the Monkey forrest the Agung Temple, referred by many as a sanctuary. It is part of the Balinese cosmology to belief that natural landscapes and inanimate objects possess souls which can help or get in the way of life on Earth. To maintain harmony with ancestors and spirits of the outside world is to the Balinese as important as daily life. Therefore Sacred Temple Monkey Forest Ubud is a site of many festivals and celebrations. Even cremation ceremonies used to communicate with that outside world. Sustaining the population of long tailed macaques monkeys which live in the forest of Padang Tegal may in fact depend on conservation of Bali forested areas. Macaques thrive on Balinese climate and live in areas heavily utilized by humans. Be careful when walking down the roads. Monkeys are quite used to tourists and are known for stealing bags, sunglasses, sometimes even cameras. Balinese people are one of the most friendly and genuine people who focus their lives on preservations of their culture, celebrations and family gatherings. They are hospitable, friendly and in Ubud rarely spoiled by modern ways. It was the Dutch colonizers who first noticed artistic talent in the Balinese. And inspired them to create even more artistic pieces. Ubud Art Everywere became their center. There are villages of artists here creating exquisite paintings, handicrafts, fabrics all of which are sold in numerous galleries around town. Even if you re not an art lover, your will find yourself appreciative. Enjoy your morning coffee overlooking lush greenery of rice fields or river gorges. Whether its the cheapest or the most expensive accommodations in Ubud The Heart of Bali. It will have a garden, rice field view, geckos, birds and even morning roosters to remind you of just how close you are to nature. Balinese are very spiritual people who frequently practice yoga and mediation. Overtime Ubud, the Yoga Paradise has become a base for many yoga and meditation workshops. With many schools and centers around you can take this further by enrolling into a workshops. O you can have a private session with holistic and metaphysical healers, reiki masters and even astrologists. Meditation and Yoga are an integral part of Hinduism. The people are altogether very spiritual and have numerous stories about priests and healers that have become enlightened after contemplation or achieved a higher state of consciousness. Yoga and meditation are essential elements of the journey towards achieving states of higher spiritual awakening and proper health, and well being. Most Balinese practice yoga on their own and in their quiet time. But many have become skilled instructors teaching others and offer classes all around the city. With an increase in tourism. Ubud became the world center for yoga and healing attracting spiritual visitors and yogis. One of the best centers is Yoga Barns. Offers teachers workshops and classes in Yoga and Pranayama, Basic Yoga, Yin Yang Yoga, Hatha Yoga, Vinyasa Yoga, Ashtanga Yoga and others. Shopaholics will feel at home in Ubud, with an abundance of shops, stalls, markets, and boutiques ran. Tegalalang, is one of the best places and most visited for shopping. With amazings ricefiles and landscapes. Local Balinese who sell one of a kind paintings, fabrics, furniture, unique pieces of jewelry, handcrafts any many many more under affordable prices. Tegalalang area, just about 15 minutes drive outside of Ubud. Surrounding gorge full of rice fields has over the years attracted many photographers who captured its images on film and photos. Overtime Tegalalang rice fields became an attraction in itself. Even though a lot of rice fields surrounding Ubud have been converted. Terrace rice fields still remain the most popular feature of Bali landscapes. Most of them have been created around 9th century and engineered by the Balinese themselves using water coming from the mountains. The result are step, garden like terraces designed on hillsides and mountain edges with irrigation channels that keep them wet all year round. For a Western shopper used to malls and proper clean stores Ubud market may at first glimpse be a shock! Upon entrance you are immediately taken over by noises of sellers trying to strike a bargain, labyrinths of walkways, strange smells of food. 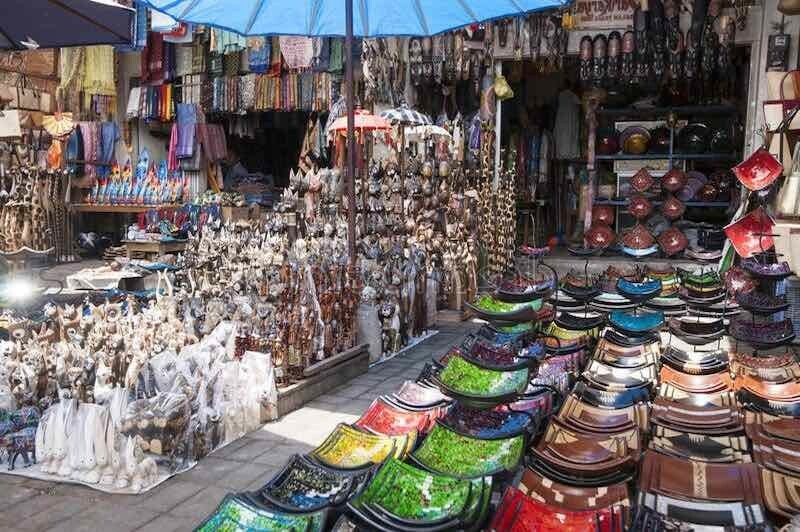 Yet an overwhelming variety of exquisite arts and crafts hanging from stalls that are brought for sale from all over Ubud Market and surrounding area. Food lovers will be happy with the varieties of foods and eateries available in Ubud the Heart of Bali. There are restaurants on almost every corner of the street. That range from very inexpensive Indonesian Warungs to more pricy European and Asian types such as Japanese, Indian, French, Italian restaurants. Couple restaurants in Ubud the heart of Bali have also won awards for being the best in Asia.